Addison Abbot is a dreamer—she dreams of owning her own cake shop, of traveling the world, of finding Prince Charming. But when it comes to actually following any of those dreams, she's a little, well, stuck. So when a devilishly handsome stranger saves her from two robbers with guns and pulls her into the adventure of a lifetime, she's determined to find her fairytale ending—until she realizes he's the most wanted criminal in America, that is. 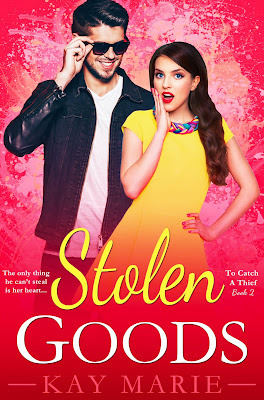 Stolen Goods is the second book in the series. When I got a chance to read it, I was very excited but also a bit reluctant. As the reading and finishing a series goes, I'm not the best. I haven't finished a single series last year, that wasn't a re-read *sigh*. It's especially hard when the first is an amazing as Hot Pursuit was, cause let's face, second in the series-with few exceptions-rarely lives up to the first one. Once I actually started reading it, I was blown away. Not only it pull you in right from the start, (I made the mistake of starting the book late at night and read till morning:) ), I loved it even more than the first one. It really is. :) Thank you for reading!